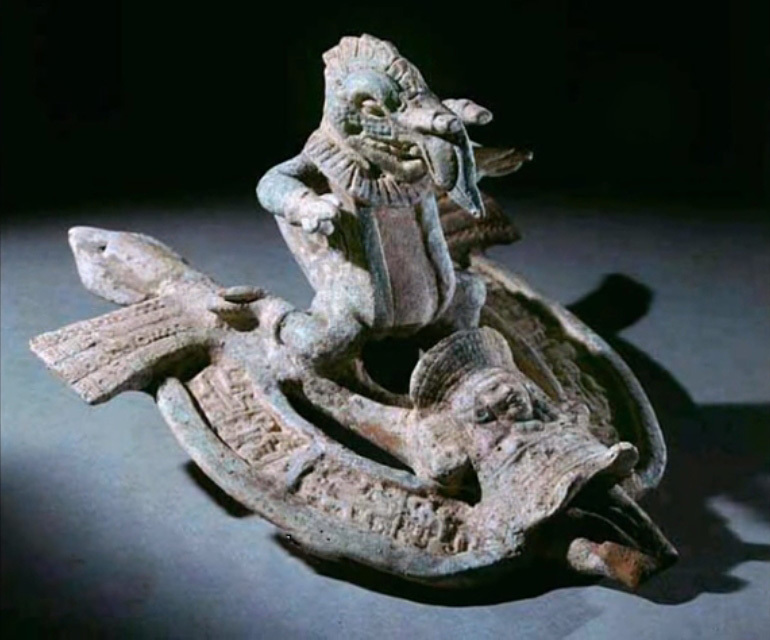 In a dry area in Central Mexico, between the cities Pinos and Ojuelos de Jalisco, the most bizarre artifacts have been found (1), (2) over a period of many years. 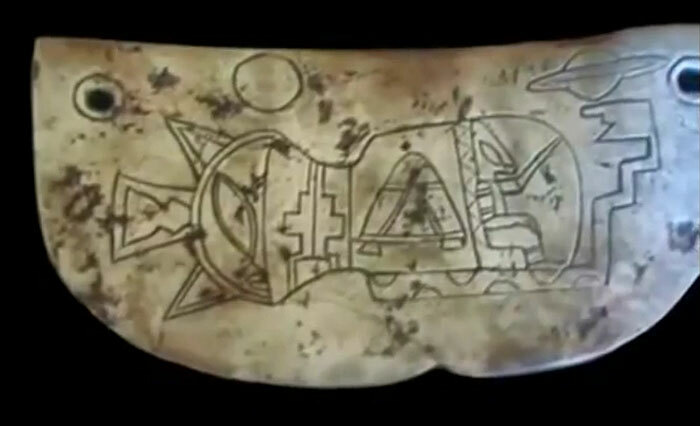 They have been investigated for more than ten years by researchers of the Nahui Ollin Foundation ("Nahui Ollin" is the Aztec name for the era we live in at his moment, the so-called "Fifth World"). They try to convince the government and scientists of the importance of their findings, but the establishment shows no interest at all. The works of art sometimes refer to Aztec calendars, but also show pictures of astronauts (3), comets and extraterrestrial beings. Many UFO's can be seen (4). Among others, there is one that flies out of the sun, in the tail of a comet which is pulled by another UFO (5). There are figures with pointy heads, with long heads, small eyes or very big eyes. Solar eruptions are pictured, as well as black holes, wormholes, UFO's with beings in them, you name it. The materials used and the expertise with which the objects are created, baffle the researchers. 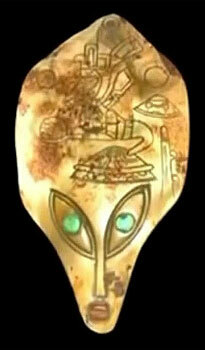 For example a big alien head has been found which is put together from several kinds of stone and rock. It is so beautifully finished that not a single edge between the materials is perceptible (6). Many objects have been taken home by the finders, and are now decorating living rooms in the region. But there are so many of them, that new pieces are still being found regularly. One farmer found no less than 3,000 artifacts in a cave. 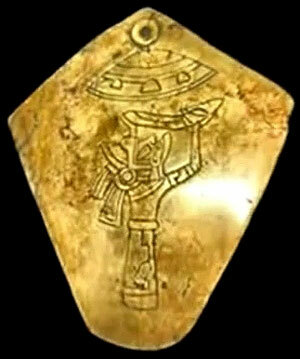 Several of them were sent to the Austrian artifacts researcher, Klaus Dona, who also did research on them (7). Dona concluded that of those 3,000 objects, 2,500 are made of stone, varying in size from about a medallion to 20 inches (8). The rest are made from kaolin, a clay-mineral that nowadays is used for making ceramics and fireproof materials. Other uses for it are fillings for glue and paint, as a coating for high-quality paper, and even as a cure for diarrhea. No two pieces are alike. Many objects have a thin layer of patina, but when Dona wet it, to his own surprise, it came off easily. He then thought it was fake, but according to an expert he consulted, this was appropriate. When the machining process isn't exactly used as it should be, the sheen can be washed away from kaoline, by sunlight or moisture. Even after hundreds of years. To make the story even more baffling, among the 3,000 artifacts in the cave a crystal skull was also discovered.